The disaster three days ago left more than 270 people missing and at least 29 people dead. MOKPO, South Korea — The captain of a sunken South Korean ferry was arrested Saturday on suspicion of negligence and abandoning people in need, as investigators looked into whether his evacuation order came too late to save lives. Two crew members were also arrested, a prosecutor said. As the last bit of the sunken ferry’s hull slipped Friday beneath the murky water off southern South Korea, there was a new victim: a vice principal of the high school whose students were among the passengers was found hanged, an apparent suicide. The Sewol had left the northwestern port of Incheon on Tuesday on an overnight journey to the holiday island of Jeju in the south with 476 people aboard, including 323 students from Danwon High School in Ansan. It capsized within hours of the crew making a distress call to the shore a little before 9 a.m. Wednesday. Only its dark blue keel jutted out over the surface. But by Friday night, even that had disappeared, and rescuers set two giant beige buoys to mark the area. Navy divers attached underwater air bags to the 6,852-ton ferry to prevent it from sinking deeper, the Defense Ministry said. The coast guard said divers began pumping air into the ship to try to sustain any survivors. Strong currents and rain made it difficult to get inside the ferry. Divers worked in shifts to try to get into the vessel, where most of the passengers were believed to have been trapped when it sank, coast guard spokesman Kim Jae-in said. Investigators said the accident came at a point where the ship had to make a turn, and prosecutor Park Jae-eok said investigators were looking at whether the third mate ordered a turn that was so sharp that it caused the vessel to list. The sharp turn came between 8:48 a.m. and 8:49 a.m., but it’s not known whether it was done voluntarily or because of some external factor, said Nam Jae-heon, a spokesman for the Maritime Ministry. Another angle being probed is the role of the captain, 68-year-old Lee Joon-seok. Senior prosecutor Yang Jung-jin said Lee was detained early Saturday, along with the two crew members. Lee faces five charges including negligence of duty and violation of maritime law, according to the Yonhap news agency. Yang said earlier that Lee was not on the bridge when the ferry was passing through an area with many islands clustered closely together, something he said is required by law so the captain can help a mate make a turn. The captain also abandoned people in need of help and rescue, he said. “The captain escaped before the passengers,” Yang said. Two crewmembers on the bridge of the ferry — a 25-year-old woman and a 55-year-old helmsman — also failed to reduce speed near the islands and conducted a sharp turn, Yang said. They also did not carry out necessary measures to save lives, he said. Another focus of the investigation is that a quicker evacuation order by the captain could have saved lives. Police said the vice principal who was found hanged from a tree on Jindo, an island near the sunken ship where survivors have been housed, had been rescued from the ferry. Identified as Kang Min-kyu, he was the leader of the students traveling on a school excursion. In his suicide note, Kang said he felt guilty for surviving and wanted to take responsibility for what happened because he had led the trip, according to police. He asked that his body be cremated and the ashes scattered where the ferry went down. With only 174 survivors from the 476 aboard and the chances of survival becoming slimmer by the hour, it was shaping up to be one of South Korea’s worst disasters, made all the more heartbreaking by the likely loss of so many young people, aged 16 or 17. The toll rose to 29 after the body of a woman was recovered, authorities said early Saturday. The country’s last major ferry disaster was in 1993, when 292 people were killed. A transcript of a ship-to-shore radio exchange and interviews by The Associated Press showed the captain delayed the evacuation for half an hour after a South Korean transportation official told the ship it might have to evacuate. “It’s hard for people to move,” replies the crew member on the radio. Oh Yong-seok, a helmsman on the ferry, told the AP that the first instructions from the captain were for passengers to put on life jackets and stay where they were as the crew tried to control the ship. About 30 minutes later, the captain finally gave the order to evacuate, Oh said, adding that he wasn’t sure if, in the confusion and chaos on the bridge, the order was relayed to the passengers. Several survivors told the AP that they never heard any evacuation order. Three vessels with cranes arrived at the accident site to prepare to salvage the ferry. But they will not hoist the ship before getting approval from family members of those still believed inside because the lifting could endanger any survivors, said a coast guard officer, speaking on condition of anonymity, citing department rules. 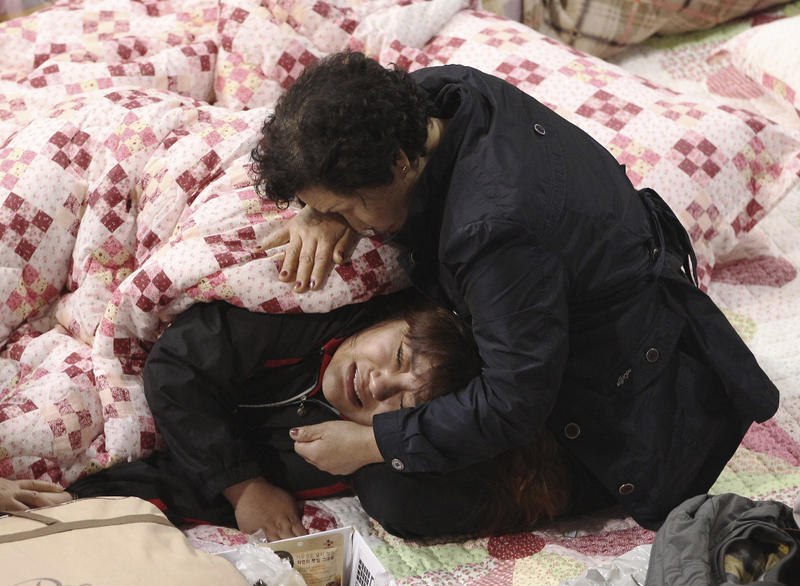 On Jindo, angry and distraught relatives watched the rescue attempts. Some held a Buddhist prayer ritual, crying and praying for their relatives. 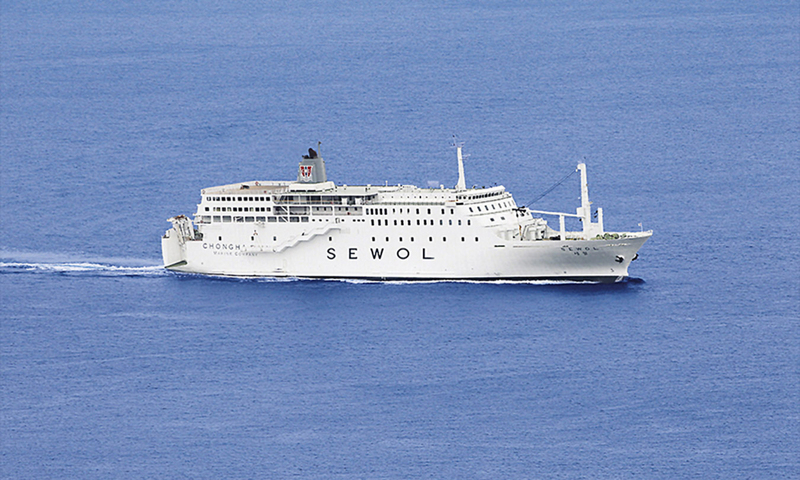 Chonghaejin Marine Co. Ltd, in Incheon, the operator of the ferry, added more cabin rooms to three floors after its 2012 purchase of the ship, which was built in Japan in 1994, an official at the private Korean Register of Shipping told the AP. 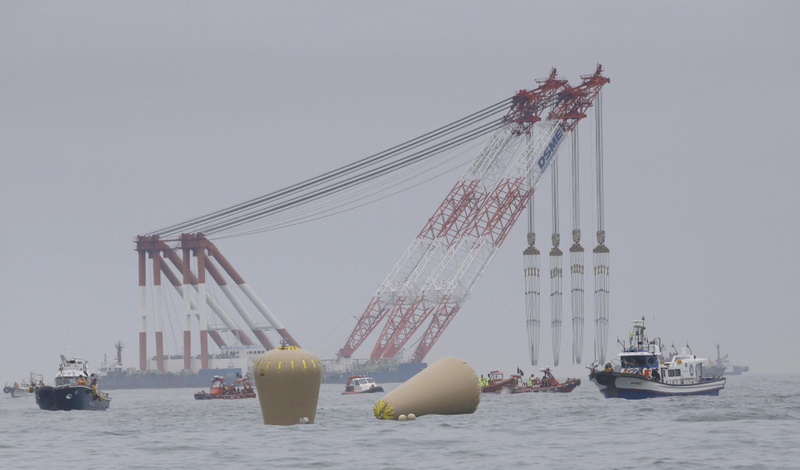 The official, who spoke on condition of anonymity because the matter was still under investigation, said the extension work between October 2012 and February 2013 increased the Sewol’s weight by 187 tons and added enough room for 117 more people. The Sewol had a capacity of 921 when it sank. As is common in South Korea, the ship’s owner paid for a safety check by the Korean Register of Shipping, which found that the Sewol passed all safety tests, including whether it could stabilize in the event of tilting, the official said. Prosecutors raided and seized materials and documents from the ship’s operator, as well as six companies that had conducted safety checks, revamped the ship, or loaded container boxes, a sign that investigators will likely examine the ship’s addition of rooms and how containers were loaded.